Ice has many meanings, from diamonds, to methamphetamine, to -- when followed by "house" -- one of the few things more dangerous than methamphetamine. 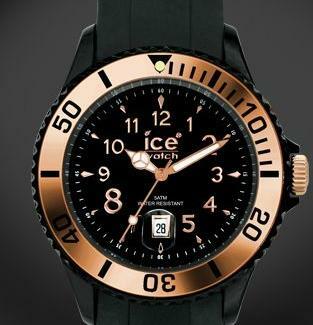 And now, watches, from Ice Watch. Finally available in our metropolis after a 2007 European launch, Ice's a 16-model-deep brand of Belgian-made classic analog chronograph-ish time machines that predominately spurn metal construction for lightweight plastics, like Rachel McAdams before Lohan starts feeding her those weird energy bars, and yes, that was just a fairly deep-cut Mean Girls joke. Sporty models include the Breitling-esque "Chrono", w/ three tiny inside dials, and either matching or loud contrasting-color bands (yellow, white, black w/ a silver/gold face), the "Classic" (w/ Rolex-esque round face, silicone band & thick casing), and the freshly released "Sili Summer", similar to the Classic but coming in 10 super-bright allover hues like "eucalyptus" green, "tomato" red, and "Tuscany" brown, which due to its Italian heritage, can make an even better Tenderoni than Bobby. Also ATL-vailable are the big-faced, screw-bezeled, industrial-styled XXL, which has a rubber band and a big ol' date meter, and the white or black, gold-bezeled, Celtic-ish-font'd Gold Rose -- so not Jalen, he's just Old Rose. As part of the "Ice World" collection, they've also got models featuring flags of all the World Cup countries either on the face or arranged on the bezel, to show your support for the only habit more loathsome than meth and crap beer: soccer.